Oracle JDE EnterpriseOne and SAML 2.0 IdP SSO Integration is a popular demand in the market. Most popular SAML Identity Providers are Shibboleth, ADFS, Azure ADFS, and Okta. This integration is feasible with a SSOgen SSO Gateway. SSOgen Gateway would be registered as a SAML 2.0 SP application with SAML IdP such as Shibboleth IdP, as defined in Configuring the Service Provider. Oracle JDE would be registered with SSOgen using standard procedure, as described in Oracle JDE SSO Configuration. Whilst a user enters into Oracle JDE, she is redirected to SSOGen for Authentication. SSOgen in redirects the user to SAML IdP for SSO Login. SAML IdP authenticates the user. 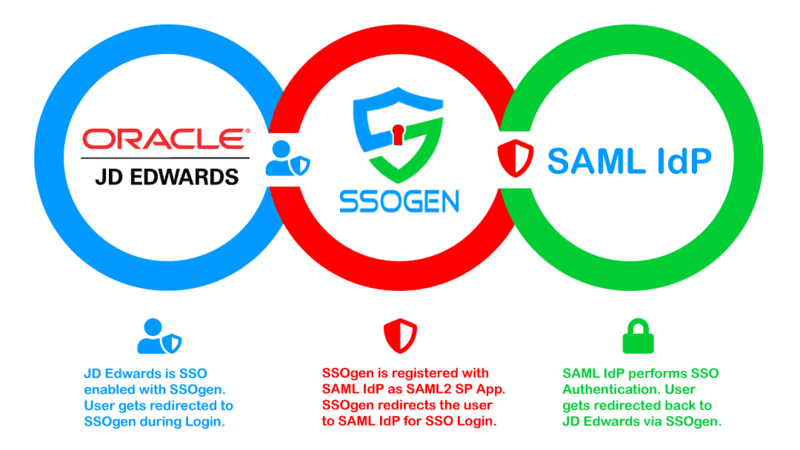 Upon a a success SSO Login at SAML IdP , the user is redirected back to Oracle JDE Applications through SSOgen. User would access Oracle JDE Applications seamlessly from other SAML IdP SSO enabled applications without having to re-login, and vice-versa. Please read more about JDE SSO Configuration.